Hi! This is another golden-oldie post, but very timely. Growers who haven’t finished up their pruning need to shake a leg because the 2013 growing season is starting as we speak! For those following my personal story, my husband has been transferred from the ICU to another floor in the hospital, which is a good sign. Thank you for the very nice emails and good wishes! ‘Tis the season. Now’s the time to get the vines pruned before they think about pushing out new growth. Pruning can be done any time during dormancy, which is usually from sometime in November unitl about mid March here. Pruning is extremely important to yields and quality. It’s the biggest single tool the vineyard manager has to influence how many shoots will emerge in the coming weeks and approximately how many grape clusters will form. Its not hard. There’s actually sort of a mathematical formula for it. The grower has fairly specific numbers in mind for shoots and cluster based upon the variety, the spacing, the vigor or the situation, and his/her experience with the site. He instructs the pruners accordingly. The skeletal picture above tells you that, from all that lush green growth of summer, after the leaves drop in November and the bare shoots are exposed, almost nothing is left behind after pruning. The picture shows two common ways (among nearly countless ways) to train a grapevine. Let’s go with the top figure. See those little bumps on the horizontal “canes” or shoots? Those are buds, or growing points. 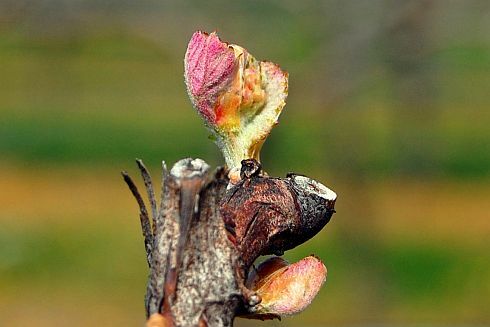 When the vine wakes up, each bud is expected to push out a new shoot. And each shoot will produce two clusters, give or take. We know, from experience, that the clusters will emerge from the new shoots, but very close to the old shoot. Those two horizontal canes were new growth the previous spring, so the clusters will hang just below the trellis wires. As many a vineyard manager has reflected, the vines haven’t read the textbook so a bud may push out more than one shoot and a shoot may produce more or less than two clusters. There’s nothing to be done about less, of course, but if there are more shoots than anticipated they’re thinned out in April. Too many shoots cause overcroppping and crowding – which exacerbates mildew problems. Later, after the vines flower, since too many clusters may lead to diluted flavors, any excess is cut off. So, at least among top-quality producers, the leaf canopy and the clusters will be monitored from the beginning until nearly the end of the growing season in an effort to make the season go smoothly and promote flavor intensity. Easy for me to say “It’s not hard.” Better to ask the pruner who won this year’s annual pruning competition! He walked away with $600.00 in cash plus a bunch of other goodies. Way to go! And, from those bare “bones” a lush, green canopy will emerge again. Soon! Better late than never! As you drive through Napa Valley, you’ll notice little bits of fragile, lovely green growth on the tough, woody vines – a sure sign of spring. The vines are like rose bushes – they drop all their leaves and go dormant after harvest. All you see in the winter months is the vine skeleton – they really look like their dead. But to me, even dormant vines have a special, craggy beauty. Just by looking, it’s hard to imagine they’d ever grow again, but low and behold, just like every year the buds of the dormant vines have swollen up and pushed out the first, tender new growth of the season. Normally, we look for bud break in mid March. But after a very wet, cold (by our standards!) winter the vines chose to sleep in this year and the first bits of pink and green growth appeared in early April. So, the 2011 vintage is off to a late start. And, that’s neither good nor bad – it all depends upon what happens, weather-wise, between now and harvest, in the fall. A late beginning can mean a late harvest, which increases the chance of rain damage. But, a few weeks of really warm weather, and the vines catch right up!